Voda Reve Review / Good Back Scrubber? Is This The Best Loofah Back Scrubber For The Shower? I recently decided to step up my back game. What?…Yeah, let me explain, I found these great back shavers that worked well, but now that I have a new appreciation from a nice smooth back, I want to take even more care of it. So, I checking out the back shavers on Amazon and I kept seeing this loofah. 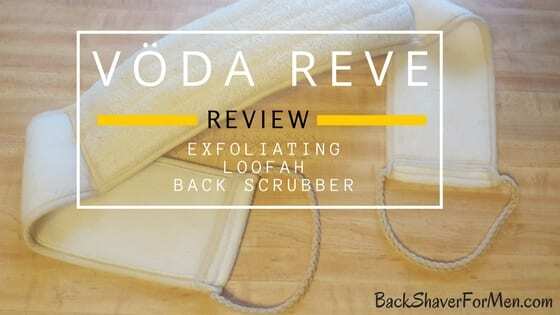 The Voda Reve Exfoliating Loofah Back Scrubber to be exact. It looked interesting and it also had a lot of reviews with a good rating. What Comes With Voda Reve Loofah? 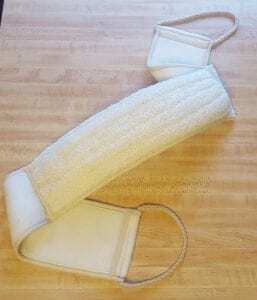 This exfoliating loofah back scrubber is 4″ X 32″ inches. Which more than adequately covers my back when using it, and I am pleased with the width and length. This loofah is two-sided. One side has the rougher loofah and the other side has the polishing ultra-soft cotton. In addition to this, there is a pouch which is the right size to hold a bar of soap. If you shower gel, bar soap or liquid soap you can just apply to the middle portion of the loofah side. The loofah side you use first with or without soap, then proceed to the other side of the scrubber to gently polish the skin. At both ends of the scrubber, it has rope handles, in which to effectively hold and scrub your back using a side to side motion. The rope reminds me of the old soap on the rope, rope, from back in the day. Brought back memories of all the old jokes associated with it. When I brought this into the shower and hit it with some water, it to my surprise started to expand. This is because in the package it seemed rather flat and I thought maybe it was too flat in order to scrub the back efficiently. Once the water hit it, I was relieved at its transformed shape, and thought, “okay…this will work“. I just rubbed the…wait, what? (Let me finish please before jumping to conclusions) ivory soap bar on the loofah side and got a decent dispersal of soap on it. See. When I was exfoliating, I was really liking this system. The handles, the length of the scrubber, the simplistic nature of it. It works and well, and I was comforted by knowing that this wouldn’t break like other back scrubbers, I have owned in the past. Either through dropping it in the shower (I’m going to stop your joke right there…) or the accumulation of water and heat working its deterioration on the scrubber connections. This should last a long time…as long as you perform the simple caring for loofah instructions. I didn’t use the other side for the polishing as I didn’t know at the time that this was a feature. 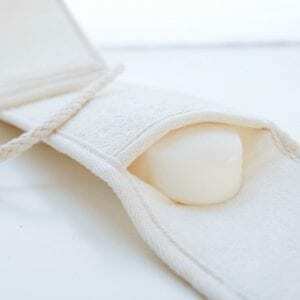 Later, I did use the cotton side, it and it did provide some additional smoothness to my back. Won’t break! We have all bought those wood handle back scrubbers that lasted a couple of months before the heat and water destroyed them and they came apart. Not with the Voda Reve. I think this is one of biggest selling points. It’s going to last a while with proper care of course. Dries out completely before the next showering. Following the rinsing and squeezing the excess water out, it is completely dry when I go to use it the next morning. With proper care, I have noticed zero smell from this after a solid month of use. Easy and fast maintenance. Less than a minute in the shower and the maintenance is done in order to keep this clean and fresh. Product registration benefit. Register your loofah, sounds weird…right? But why not, Simple three lines to fill out and you are entered into the monthly drawing for $50 Amazon Gift Card. Nice! Plus you will get new product information and discounts. Made from a natural loofah and bio-degradable. I am getting more and more Earth conscious and hate buying plastic, anything plastic is future land-fill material in my mind. Giving the choice I go natural. Voda Reve provides contact information for product purchase to help ensure customer satisfaction. Good length. I am a big guy 6’2″ 250 lbs and it easily covers my entire back when I use it and doesn’t make me wish it was longer. Goldilocks texture, not too rough, not too soft…just right. Solves the ever problem of washing ones back efficiently. The cotton material on this scrubber is soft. You can use any soap with it: Bar soap, shower gel, or liquid soap, as well as no soap as well, if that is what you prefer. I don’t judge. High-quality loofah and scrubber. It’s the right texture and as the package says, “Spa Quality” and I concur with this. Versatility. Able to use in other areas as well, not just the back. A little maintenance is required to keep this fresh and clean. Failure to do this will result in a bacteria-ridden loofah. YUCK! Rinse it out thoroughly before leaving it to hang and dry. This will prolong the life of the loofah as it will rinse all the dead skin cells and soap away. Squeeze it a couple of times to facilitate the drying effect before hanging it to dry. Try not to leave it folded, instead leave it to hang straight vertical to allow better drying. If you put a bar of soap in there, I would take it out when hanging it to dry. To be able to rinse all the soap out of it before hanging to dry. A good way to check if the loofah is clean and sanitary is to look at it it should look like when you bought it. Also smell it, it should not smell funky or sour. If it does it is not drying properly and should be sanitized or thrown away. To sanitize your loofah, simply add 2 TBSP to 1 quart of water and immerse into the liquid for 10 to 15 minutes, then rinse, wring it out a couple of times then hang vertically to dry. Some people also use bleach, that is up to you, I use vinegar. This product has got your back…literally. I had given up on back scrubbers for their lack of longevity years ago, but am back aboard the back scrubber wagon again. Especially, since I am able to shave my back again and enjoy my backs appearance once more. I just care more about my back, that is the by-product of shaving one’s back and the Voda Reve Exfoliating Loofah Back Scrubber is there to add that finishing polish to a once savage looking back. I highly recommend this back scrubber, whether you shave your back or not. This will last, with proper care. There is little to say negatively about this product, as I really struggled to come up with anything. A true sign of a company delivering a solid product. If you have any questions or comments, as always would love to hear them.